Time to throw that old mattress out. Sleeping on the floor is good for you, as many articles on the internet have pointed out. Many people have difficulty to sleep on the floor comfortably if they’re first starting out. Sleeping on the floor provides benefits such as realigning your natural posture, increasing blood circulation, and reduce tension on your back. It’s definitely a rough start if you’re going into this for the first time. But many people can adjust their body to sleep on the floor normally after a couple of weeks or often a few days. Anectodal evidence has led expert researchers to suggest that sleeping on the floor is good for your back and can be a treatment for lower back pain and joint pain. When it comes to sleeping on the floor, look no further than the Eastern world. Various cultures have been sleeping on the ground for ages. In Japan, they have perfected the way to sleep on the floor. For many people, ditching the mattress and sleeping on the floor is a good first step into living as a minimalist at home. This led me to run a trial of sleeping on the floor for a duration of 3 weeks. To my surprise, it was a fulfilling experience. This allowed me to find even more new ways to sleep on the floor properly without a mattress. This is standard preparation for anyone planning on sleeping on the ground. Go to an empty room if you can. It’s just more comfortable to leave enough space for you to sleep on the floor. Remember to vacuum the floor before sleeping on the ground! A lot of dust can be inhaled in if you forget this step. Sleeping on the floor is bad for you if you have allergies. Too often, sleeping on the bare floor can be a miserable experience and it’s the number one reason why people stop sleeping on the ground. Use a thick blanket and pillow if you can. Multiple blankets if the ground is too cold. A blanket may still not be comfortable enough for you to sleep on the floor, it takes time to get used to. Use more than one pillow to provide extra cushioning. Your legs and back will probably be the most difficult to adjust to sleeping on the floor. If you are really serious about sleeping on the floor, you should consider investing in a tatami mat, which is made of woven grass and rice straw core material. They are often layered with Japanese futon mattresses and a tatami bedframe. Sleeping on a tatami mat makes a considerable difference than sleeping on the bare floor. They’re gentle enough to lay on and firm enough to walk on. Tatami mats are comfortable in its own unique way and there many sizes and variations they can come in. Check out this guide on choosing a tatami mat to buy if you want to practice sleeping on the floor with a tatami mat. It’s definitely more clean and safe than sleeping on the bare floor. People have also noted that tatami mats give out a grass-like scent. If tatami mats aren’t comfortable enough and you want to sleep on the floor comfortably and prefer to have a bed and mattress-like experience—see below. In Japan, the shiki futon (futon mattress) is typically slept on while being on the floor. Light and comfortable, the shiki futon is a good choice if you want to sleep on the floor comfortably. These mattresses are often paired with tatami bedframes and mats but they are not necessary. The EMOOR all-in-one bed set is ideal for a comfortable sleep on the floor. Includes a futon mattress, a comforter (kakebuton), and a pillow. It’s basically everything you need to sleep on the floor comfortably. The best part? You can fold up the mattress, comforter, and pillow to store it in a closet. Total space-saver. 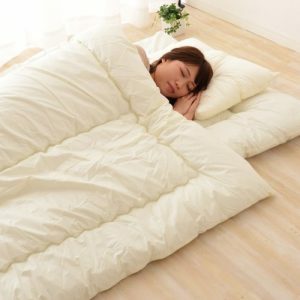 Take out futon bed set only when you need it. Is the shiki futon right for you? Some of the best features of a Japanese futon mattress is that they are economical, compact, and minimalist style. Fold it, roll it, and store it in a closet for storage. The shiki futon is the ultimate minimalist mattress. It’s a simple mattress that’s convenient and occupies limited space. In Japan, the shiki futon is a traditional Japanese mattress has been used for thousands of years and continues to be a staple in their culture and the way the Japanese sleep. If you’re not familiar with Japanese style beds, check out How to Choose a Japanese Shiki Futon (Futon Mattress). If you want further comfort, look into a pillow for neck support. Sleeping on the floor has many benefits such as reduction of stiffness, back pain, and joint pain. To keep in better alignment with your natural posture while sleeping on the floor, a pillow for neck support is important in maintaining a natural body position. Using a gently sloped pillow to cradle your neck can alleviate neck and shoulder pain. The slope of the pillow keeps your head in a stable position all night so that you can get the rest you need. Want to give sleeping on the floor a try without breaking the bank? A plain-old sleeping bag should get you started. You might have a sleeping bag laying around in your garage that you can use. Another pro-tip: put a yoga mat underneath the sleeping bag for extra comfort.